When you consider passing on your wealth to your family, you have to face a hard truth: taxes. When you pass away, the executor of your estate has to settle everything with the Florida Department of Revenue and the Internal Revenue Service (IRS). Depending on how your estate is structured, your estate may owe both state and federal taxes. One of the taxes that will likely apply to your estate is the federal estate tax. To learn how to minimize or avoid this tax to benefit your family, contact an experienced West Palm Beach estate planning attorney for assistance. Since Jan. 1, 2005, Florida estates no longer owe any estate tax. However, that does not mean an executor can ignore state tax paperwork or liabilities. Depending on the estate’s federal tax obligations, certain forms may need to be completed. If your estate is not subjected to federal estate taxes, the executor must file Florida Form DR-312. If your estate is liable for federal estate taxes, he or she must file Florida Form DR-313. Whichever form is relevant must be filed with the county clerk where your property is located – not with the Department of Revenue. Florida does not have a personal income or inheritance tax either. However, if you owed state taxes prior to your death, your estate will need to pay that liability. Additionally, your beneficiaries may owe taxes on some of the income or assets they receive after your death. Generally, you could have been taxed on property or income during your life, then the recipient can do. If you are concerned about the tax ramifications for your beneficiaries, contact an attorney. There are ways to structure your estate to minimize the impact of state and federal taxes on your family. Depending on your estate, your executor may have to deal with the federal estate tax. As of 2017, if you have combined gross assets and prior taxable gifts of at least $5.49 million, then you will be subjected to a 40 percent estate tax. So long as your estate is valued at less than this amount, it will not be subjected to this additional tax. However, your estate may still be subjected to federal income tax as you were throughout your life. If your assets generate income, such as commercial or residential properties that rented to tenants, then your estate will owe income tax. Your executor will have to be sure to properly file your estate taxes to ensure this is accurately calculated and then paid. 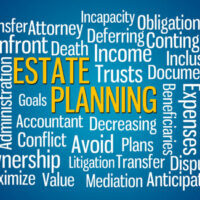 There are ways to structure your estate to avoid the impact of an estate tax. First, you and your attorney could work to minimize the value of your estate so that it is below the IRS threshold amount. This may include utilizing trusts, jointly owning property with others, or transferring property before your death. A common strategy to avoid taxes is to establish an irrevocable trust during your life. You can transfer certain assets to this irrevocable trust and create it so that the income of the trust or its principal assets go to the intended beneficiaries, be they family members, friends, or charities, in the future. Depending on the structure of your estate, tax matters may be simple or complicated. In either case, it is essential your state and federal taxes are addressed properly so there are no lingering liabilities. However, there are ways to minimize the future tax consequences on your estate and beneficiaries. Contact us at the West Palm Beach Law Offices of Larry E. Bray online or by calling 561-571-8970 to schedule a consultation and learn more.